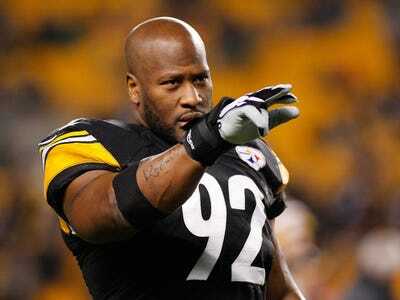 Former Pittsburgh Steelers linebacker James Harrison signed with the New England Patriots on Tuesday. The Patriots have made a habit of finding veterans who have a bit left in the tank to fill out their depth. Harrison spent 14 seasons with the Steelers, but now joins their AFC rivals, setting up a potential must-see reunion in the postseason. The Pittsburgh Steelers waived five-time Pro Bowl linebacker James Harrison on Saturday in a move that surprised many around the NFL. But while Harrison was not claimed by any team during the waiver process, he wasn’t out of the league for long. The Patriots have made a habit of looking to veterans to fill out holes in their roster heading into the final weeks of the season. Already this year, they claimed tight end Martellus Bennett off of waivers after Green Bay decided they were done with him, and just three weeks ago New England signed Kenny Britt to add some depth to their receiving corps heading into the postseason. With starting linebacker Dont’a Hightower going down for the season back in October, and the Patriots “next man up” mentality being tested by injuries all season, it’s no surprise that they were interested in seeing if Harrison has anything left to offer them for their upcoming playoff push. Harrison joining New England also sets up a potential unmissable reunion should the Patriots and Steelers meet again in the AFC playoffs. Harrison spent 14 seasons with the Steelers over his long NFL career, and won two Super Bowls with the team. It would be especially Belichick-ian if the final chapter of his career was turning against his former team to secure a third ring.